52’, proposed by Bruno Evenou. 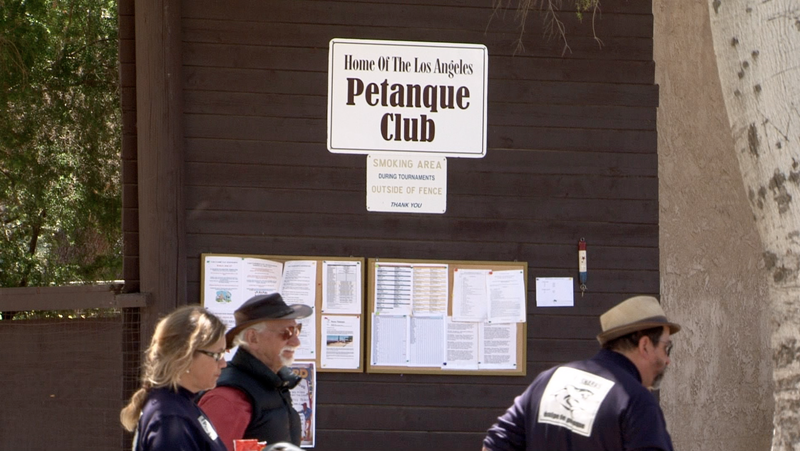 From rural campgrounds to Los Angeles, the sport called pétanque – which is first a French bowling game, has in recent years emerged as the newest chic worldwide phenomenon. From the famous “Place des Lices” at Saint-Tropez in the south of France, by way of the hip new pétanque-aperitif happy hours now carried out in parks like the Palais-Royal in Paris, Hyde Park, and Central Park, New York City – the once provincial game continues to gain ground. Today there are over 80 national pétanque federations flowering in over 70 countries around the world – Thailand, Madagascar, Belgium, Luxembourg, Germany, Spain, The Netherlands, Switzerland, Great Britain, Finland, Denmark, Israel, Slovakia, Russia, Morocco, Tunisia, the USA, Canada, New Zealand, Australia, Japan, Laponia… each one hoping to shine at the World Championships held every two years. Marseille, the historical capital of pétanque is also the home, each year, of the « Mondial la Marseillaise à Pétanque » – « World Petanque Cup at Marseille », an event that gathers 5 000 teams, 15 000 players, and which between October 4 and 7, 2012, will host the next edition of the Pétanque World Championships. Although pétanque is becoming a terribly hip and cosmopolitan multi-culture, it still retains deep appreciation for a simple atmosphere, joviality and calm, the slow life. Global, cosmopolitan, legendary, laid back and natural yet all the while urban and sophisticated, pétanque’s paths are infinite and roll across the entire world from la Ciotat to Bangkok by way of New York, Berlin, Marseille and Paris.